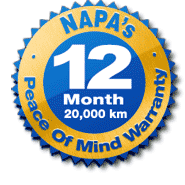 The NAPA AUTOPRO Peace of Mind Warranty provides you with 12 months/20,000 Kilometres of worry-free protection on qualifying parts and labour. Our warranty is honoured at over 13,000 NAPA AUTOPRO and NAPA AutoCare locations across North America. Where can you obtain warranty service?